Bagwell is going to get in at some point and there is no doubt about that. But the fact that Bagwell, who is a clear-cut Hall of Famer by any metric, has seen his candidacy be defined by mere whispers of illegal drug usage. Of course, Bagwell was never named in the Mitchell Report, never tested positive for any illegal substance and while he did admit to using androstenedione in 1998, it was not illegal until 2004. We can beat the PED drum all night long about Bonds and Clemens and others, and we know there is an emotional case that the writers make and continue to make to keep guys like them out. The bottom line is this, Bonds is one of the best hitters that ever lived. Keeping him out of Cooperstown is a joke quite frankly and it is ridiculous that he likely will never get in. But as noted many a time before, it one of the key examples of how silly the voting process for the Hall has gotten. Just like nobody can deny that Bonds is one of the greatest hitters ever, nobody can deny that Clemens is one of the greatest pitchers ever. Yes, the guy's a scumbag and a degenerate but there are plenty of those already inducted and he would be far from the only person in the Hall that enhanced his performance chemically. 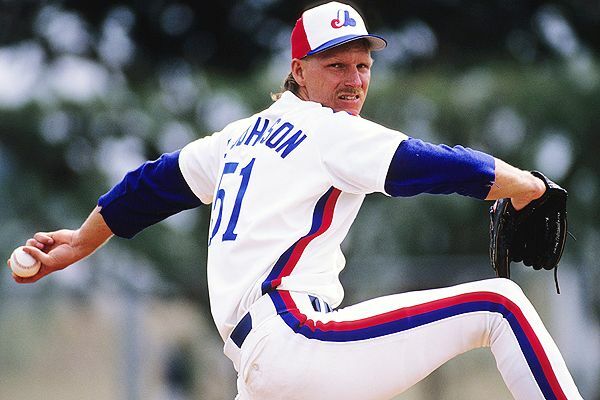 Was the Big Unit the best left-handed pitcher all of that? You could make a case for it, as Jonah Keri makes here. Johnson was without question one of the most dominant pitchers of all time and to do it in such an offensive era like the one he starred in makes it all the more impressive. He is a lock for induction. Like Johnson, Martinez is on his first year on the ballot and also like Johnson, he is a certain inductee come Tuesday. His career was great by any standard but his two-year run in 1999-2000 playing in not only a tough division, an unfavorable pitchers' park in Fenway Park and perhaps the best offensive era ever was the best two-year stretch in MLB history. Mussina only got about 20% of votes last year, leaving his induction to be in question as now the maximum years on the ballot was dropped from 15 to 10 in an odd move. However, while he was not as high profile as some of his contemporaries, he was still an elite pitcher, just as good as some who will get to the Hall, and certainly one good enough to get to the Hall. After all, he had a tremendous career while pitching in the AL East. And anybody that tries to claim that you cannot vote for Mussina if you would not vote for Jack Morris (fortunately his debate is over for now) is a total fool. Whispers not unlike those who are keeping Bagwell out of the Hall are keeping Piazza out of the Hall and it really is a joke. After all, he only is the best hitting catcher in the history of baseball. It really is ridiculous that a player of that caliber have his candidacy defined by unsubstantiated rumors and silly reasoning. Was Raines the best NL player of the 1980s? Before you answer, note that of all the players in the Senior Circuit during that decade, Raines had the highest Wins Above Replacement. Raines has been criminally underrated by the voters and he may find himself at the end of the day not in which would be an absolute shame. Yes, he played at the same time as Rickey Henderson and yes he played in Montreal but he should absolutely be in. Schilling only did a little better than Mussina a year ago in his first year on the ballot but while he never won a Cy Young and did not win that many games (relatively speaking), he certainly is a Hall of Famer. He was one of the truly elite strikeout pitchers of all time and can be referred to as a postseason legend. Of the trio of Mussina, Schilling and Smoltz, you can make a legitimate case that Smoltz may have (barely) been the worst of the three and yet he is a lock to get to Cooperstown. And he should get in, that is not the point. Smoltz excelled as both a starter and then as a closer, played a big role on some tremendous Atlanta teams and was sensational in the postseason. Those are my ten on my ballot. Below are the guys that I ran out of room for on my ballot but would certainly vote for. I thought that Biggio was going to get in a year ago when I broke down the 2013 voting results but he came up only a couple of votes shy. He will get in and while some will sneer at his induction, saying that he is only getting in due to getting 3,000 hits, he is a deserved Hall of Famer in my opinion. He was a player that excelled at multiple positions (being an All-Star at catcher and at second base), and when you factor for his time behind the plate and in center field, he gets to the standard. He is one of three players to get to 3,000 hits, 250 homers and 350 steals and if you want to really get people cranked up, compare his numbers with Derek Jeter's. Martinez was without question a Hall of Fame hitter during his career and it is silly to penalize him for being a DH when there are plenty of players in the Hall that were elite hitters that were dreadful in the field. Just because Martinez's career coincided with the DH should not penalize him, and since it did not penalize Paul Molitor, it seems silly to penalize him here. He was the closest of these guys that I chose to preclude from my ballot that I would vote in. Trammell is another one of those guys who have been too underrated for far too long and will never be elected to the Hall of Fame (although who knows about the veterans' committee down the line). Trammell was not as high-profile as some of his fellow shortstops like Cal Ripken, Jr. in his prime or Barry Larkin later on but he simply was an excellent ballplayer for some darn good Detroit teams and had the kind of career that should get him to Cooperstown. Walker is somebody that I was previously on the fence for and had him as barely a no but now I have shifted and put him as a yes. Did playing half his seasons at Coors Field help? Without question, but he is far from the only player to take advantage of a hitters' park. Walker was an excellent hitter outside of Denver and had he stayed healthy for the entirety of his career, he would certainly be headed to Cooperstown. Garciaparra is not going to get in but when you compare his peak to the peak of the shortstops already inducted in Cooperstown, he does barely clear the standard. And he did look like a Hall of Famer when he was at his peak but he really fell off once he was traded from Boston to Chicago in 2004 and his career was ultimately too short to get in. Kent is a guy that looks like a quality Hall of Fame candidate, after all he was one of the strongest offensive second basemen in the last 50-plus years but when you get the full picture of his resume, he is shown to not be a worthy admission. His WAR and his JAWS both fall short of the standard, and it really is not that close. The fact that he was a pretty mediocre fielder does not help matters that much. That said, I do have an open mind and may be convinced at some point down the road but for now, he's a no. Donnie Baseball is going to fall off the ballot either on Tuesday or next year and while he does not deserve to get into the Hall, had he stayed healthy throughout his career he would have. He and Garciaparra have similar cases in that they were not good for long enough and now it is interesting that both are involved with Dodgers baseball with Mattingly being the manager and Garciaparra working as an analyst. McGriff is a guy that folks want to be in the Hall of Fame when you have guys getting on the ballot with ties (some legitimate and substantiated, some absolutely ridiculous) to performance enhancing drugs. But save for his home run totals of 493, which would look great a couple decades ago but in a greater offensive era it doesn't look that impressive, his resume is lacking because he was never considered an elite player (no MVP's, one top five finish) and was never much in the field. Let me make this clear: I would not vote for McGwire because he admitted to using steroids. I would leave McGwire off of my ballot because while he was all-time elite at one thing (guess), he really was not all that great at anything else. I would be more inclined to vote for him than Sosa (more on that in a moment) and perhaps down the line I could see things differently down the line but as for now, he is a no. Like the candidates that sandwich him on the list, Sheffield is dogged by steroid allegations but like McGwire and Sosa, that is not why I discount him from the list. The fact that he was a train wreck in the field does not help matters and he ultimately falls short of the standards of his position. That said, he was a damn good hitter and should be remembered as such. I'm going to rehash the steroids thing here because I've written it multiple times in this post already. But like McGwire, he is a borderline case regardless of the steroids issue even with 609 home runs. His WAR for his career comes about 15 points shy of the Hall standard, even though his prime is one point in the clear, which could lead to some to say that this is an enhanced (no pun intended) Dale Murphy resume because of a strong peak but everything else being subpar. Plus, something to note that even with those huge homer years, he only finished in the top five of the MVP vote once, when he won in 1998. Smith retired as the all-time leading saves leader and he did have himself a very good career. But considering that closers have such limited impact on the course of a game compared to every other position, you really have to stand out in my opinion as a closer to get in. Smith was very good and just as deserving, if not more, as 2006 inductee Bruce Sutter but I do not think he was good enough for the Hall.